Hi ladies! I hope you're all having a wonderful weekend. I am completely knackered at the moment after having just worked 9 days in a row x) It was mostly self inflicted of course but I have so much blog reading, blogging and housekeeping to do before it all starts again!! I have a NOTD for you that I did a few days ago to help lift my mood. 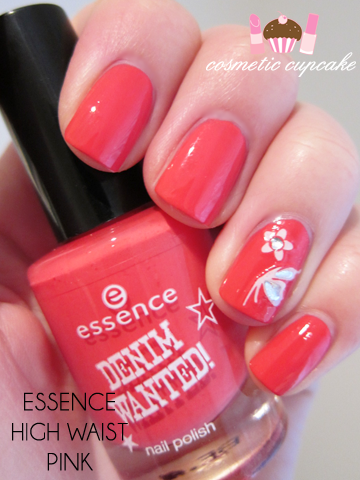 I used Essence High Waist Pink from the Denim Wanted! collection that Christina sent me for my birthday! This lovely bright polish was perfect to see in the end of Summer. 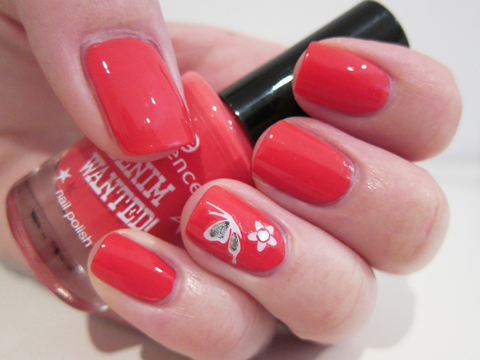 High Waist Pink is a lovely creme polish that's more coral than bright pink on the nail. In real life the colour is lighter than in my pictures, it's another hard polish to capture! High Waist Pink is the perfect colour for Summer/Spring and I think I'll use it as a pedicure colour soon. It was a bit streaky to apply so I used 3 coats and a coat of Color Club Vivid Color Intensifying topcoat to even it out. I then applied some Essence nail stickers Christina also included in my birthday package on my accent fingers. A quick and simple NOTD! A quick reminder that My Big Birthday Giveaway ends in just under 24hours!! If you haven't entered already make sure you do! E a nail ficou um charme!!!! @serena_nuvola: It's perfect for the warmer weather! Too bad it's getting into Winter here in Sydney boo. @Rachel Marie: This is the only colour I have from the collection and I wish I had the others. Essence polishes are so awesome! I'm in love with the color ! Very great ^^ ! Hope you feel more rested soon! gosh i love that color! i love the nail art!!! so pretty! following you now! @Fannie: It's annoying when certain shades don't suit your skintone. Perhaps try a different tone of coral? @toader: Glad you like it! @Freshie: OH I wish it was a jelly! I <3 jelly polishes hehe. @Mez: Me too!!! I don't care about the season honestly and just wear whatever colour suits my fancy! @Alice: I love corals and they are definitely perfect for summer. See if you can get this Alice! @Alex: LOL nothing wrong with lots of blues and teals in your collection! I wish I had more actually. I hoard pinks and purples hehe. @Elsa P: Thank you so much for your sweet words Elsa and for following also! I'm so glad I can inspire you to experiment with nail art =D It's so much fun and I'm sure you'll enjoy it heaps! @Oreleona: Thanks hun! Nail stickers are so simple but sooooo pretty. @1940house: Glad you like it!